"Minorca" redirects here. For other uses, see Minorca (disambiguation). Menorca or Minorca (/mɪˈnɔːrkə/; Catalan: Menorca [məˈnɔɾkə]; Spanish: Menorca [meˈnoɾka]; from Latin: Insula Minor, later Minorica "smaller island") is one of the Balearic Islands located in the Mediterranean Sea belonging to Spain. Its name derives from its size, contrasting it with nearby Majorca. 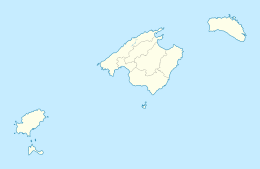 Menorca has a population of approximately 91,170 (at 1 January 2017). It is located 39°47' to 40°00'N, 3°52' to 4°24'E. Its highest point, called El Toro or Monte Toro, is 358 metres (1,175 feet) above sea level. The island had a Jewish population. The Letter on the Conversion of the Jews by a 5th-century bishop named Severus tells of the forced conversion of the island's 540 Jewish men and women in AD 418. Several Jews, including Theodore, a rich representative Jew who stood high in the estimation of his coreligionists and of Christians alike, underwent baptism. The act of conversion brought about, within a previously peaceful coexisting community, the expulsion of the ruling Jewish elite into the bleak hinterlands, the burning of synagogues, and the gradual reinstatement of certain Jewish families after the forced acceptance of Christianity, allowing the survival of those Jewish families who had not already perished. Many Jews remained within the Jewish faith while outwardly professing Christian faith. Some of these Jews form part of the Xueta community. The Vandals easily conquered the island in the 5th century. The Byzantine Empire recovered it in 534. Following the Moorish conquest of peninsular Spain, Menorca was annexed to the Caliphate of Córdoba in 903, with many Moors emigrating to the island. 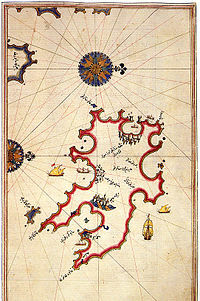 Manûrqa (Arabic: منورقة‎) was the Arabicized name given to the island by the Muslims from its annexation to the Caliphate of Cordoba by 'Isâm al-Khawlânî in 903 until the rule of the last Muslim ra'îs, Abû 'Umar ibn Sa'îd in 1287. The only urban centre of the island was Madînat al Jazîra or al Manûrqa (modern Ciutadella). Most of the population lived in small farm communities organized under a tribal structure. In 1231, after Christian forces took Majorca, Menorca chose to become an independent Islamic state, albeit one tributary to King James I of Aragon. The island was ruled first by Abû 'Uthmân Sa'îd Hakam al Qurashi (1234–1282), and following his death by his son, Abû 'Umar ibn Sa'îd (1282–1287). A Catalan-Aragonese invasion, led by Alfonso III, came on 17 January 1287; its anniversary is now celebrated as Menorca's national day. Once the island was captured, most of its Muslim inhabitants were enslaved and sold in the slave markets of Ibiza, Valencia and Barcelona, while others became Christians. Only one hundred Muslims were allowed to remain on the island. Until 1344 the island was part of the Kingdom of Majorca, a vassal state of the Crown of Aragon. Aragon subsequently annexed the kingdom and was then absorbed itself into the unified Spanish crown. During the 16th century, Turkish naval attacks destroyed Mahon, and the then capital, Ciutadella. In Mahon, Barbary pirates from North Africa took considerable booty and as many as 6,000 slaves. Various Spanish kings, including Philip III and Philip IV, styled themselves "King of Minorca" as a subsidiary title. Invaded by Britain's Royal Navy in 1708 during the War of the Spanish Succession, Minorca temporarily became a British possession. Great Britain took possession in 1713, under the terms of Article XI of the Treaty of Utrecht. Under the governorship of General Richard Kane, this period saw the island's capital moved to Port Mahon and a naval base established in that town's harbour. In 1756, during the Seven Years' War, France captured the island after the Siege of Fort St Philip and a failed British relief attempt. Thanks to the Treaty of Paris of 1763, the British returned to the island again following Britain's victory in the Seven Years' War. In 1781, during the American War of Independence, the British were defeated for a second time, in this instance by a combination of French and Spanish forces, and on 5 January 1782 the Spanish regained control of the island, after a long siege of St. Philip's Castle in Port Mahon. On the feast of the Epiphany, as an expression of joy, King Charles III of Spain ordered the viceroys, captains general, governors, and military commanders to bring together the garrisons and to extend his greetings to army commanders on the so-called Pascua Militar. The British ceded the island back to Spain the next year in the Treaty of Versailles. Menorca was invaded by the British once again in 1798, during the French Revolutionary Wars, but it was finally and permanently repossessed by Spain by the terms of the Treaty of Amiens in 1802. The British influence can still be seen in local architecture, with elements such as sash windows. In October 1993, Minorca was designated by UNESCO as a biosphere reserve. In July 2005, the island's application to become the 25th member of the International Island Games Association was approved. Minorca's cuisine is dominated by the Mediterranean diet which is known to be very healthy. While many of the locals have adopted modern attitudes they still uphold certain old traditions. 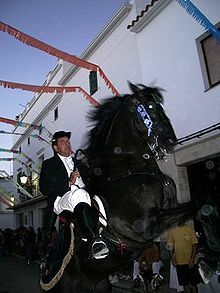 On the second day, locally bred black horses are dressed with ribbons and rosettes. The riders, or "caixers", ride the horses through the streets and, along with a tumultuous crowd of people, encourage them to rear up on their hind legs. The brave can be found running underneath them in an attempt to touch the horses hearts for good luck. As a small island, it is very seldom that there is a chance to see top level sport competitions in Menorca. In football, CF Sporting Mahonés managed to play in Segunda División B, the third level of the Spanish football league system, between 1987–1993 and between 2009–2012. In basketball, Menorca Bàsquet played in the Liga ACB, the first tier level men's professional basketball league in Spain, between 2005–2009 and in 2010–2011. Incidentally, both clubs dissolved in 2012 due to financial problems. 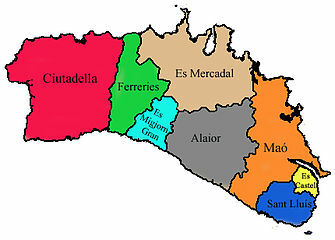 The Catalan spoken in Menorca is a variety known as Menorquí. Between Menorquí and standard Catalan, as with most Balearic dialects, the most distinctive difference is the different word used for the article "the", where Menorquí uses "es" for masculine and "sa" for feminine. Menorquí thus shares the source of its article with many Sardinian varieties (masc. sing. su, fem sing. sa), rather than the standard Catalan "el" and "la", similar to other Romance languages (e.g. Spanish el, la, Italian il, la), corresponding to a form which was historically used along the Costa Brava of Catalonia, from where it is supposed that the islands were repopulated after being conquered from the Moors. Menorquí also has a few English loan words dating back to the British rule such as "grevi", "xumaquer", "boinder" and "xoc" taken from "gravy", "shoemaker", "bow window" and "chalk", respectively. Lingering British influence is seen in the Menorcans' taste for gin, which during local festes honoring towns' patron saints is mixed with lemonade (or bitter lemon) to make a golden liquid known as Pomada. Gin from Menorca is not derived from grain alcohol but from wine alcohol (eau de vie de vin), making it more akin to brandy. It has the distinction to have geographical identity protection. Probably the best known gin is Gin Xoriguer which is named after the typical Menorcan windmill which was used to make the first gin. 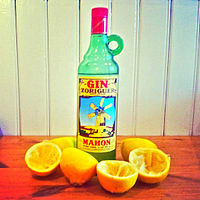 One of the reasons it is also known as Gin de Minorca or Gin de Mahón. One origin story of mayonnaise is that it was brought back to France from Mahon, Menorca, after Louis-François-Armand du Plessis de Richelieu's victory over the British at the city's port in 1756. 30 species of butterflies have been recorded on Menorca and most are on the wing from March to late September. The species that occur include the Cleopatra, Lang's short tailed blue and the two-tailed pasha. There are three species of amphibia: green toad (Bufo viridis), marsh frog and stripeless tree frog (Hyla meridionalis). The common lizard seen all over the island is the Italian wall lizard (Podarcis siculus) although the Moroccan rock lizard (Scelaris perspicillata) also occurs. The Balearic endemic Lilford's wall lizard (Podarcis lilfordi) can be found on many of the offshore islands. Two species of gecko can be found on Menorca, the Moorish (Tarentola mauritanica) and the Turkish (Hemidactylus turcicus) also called the Mediterranean house gecko. Four species of snake occur: the viperine snake (Natrix maura), grass snake, false smooth snake (Macroprotodon cucullatus) and the ladder snake (Rhinechis scalaris). Hermann's tortoise (Testudo hermanni) is quite common and can be found all over the island. Two terrapin species are also found, the native European pond terrapin (Emys orbicularis) and the introduced American red-eared slider (Trachemys scripta). The birdlife of Menorca is very well known. Menorca is a well watched island which is on the migration route of many species and good number of passage migrants can be seen in spring. Residents include Audouin's gull, blue rock thrush and Thekla lark. Booted eagle and red kite are easy to see as is Egyptian vulture in the right habitat. In summer there are bee-eaters and Menorca has major colonies of Cory's shearwater and Balearic shearwater. Taula from the site of Talatí de Dalt about 4 km (2 mi) west of Maó. Cales Coves of Menorca. Note the hand-hewn entrances to the caves. Martello tower, Alcaufar with Illa de l'aire lighthouse in the distance. ^ a b Elukin, Jonathan M. Living Together, Living Apart : Rethinking Jewish-Christian Relations in the Middle Ages. Vol. Jews, Christians, and Muslims from the ancient to the modern world. Princeton, N.J.: Princeton University Press, 2007. ^ Bradbury, Scott, ed. trans. (1996). Severus of Minorca: Letter on the Conversion of the Jews (Oxford Early Christian Texts). Oxford University Press. p. 154. ISBN 978-0-19-826764-5. ^ Gregory, Desmond (1990). Minorca, the Illusory Prize: A History of the British Occupations of Minorca between 1708 and 1802. Cranbury, NJ, USA: Associated University Presses, Inc. p. 132. ISBN 0-8386-3389-7. ^ "Valores Climatológicos Normales. Minorca / Aeropuerto". November 2015. ^ "Valores Climatológicos Extremos. Minorca / Aeropuerto". December 2017. ^ "Menorca Sea Temperature". seatemperature.org. Retrieved 14 December 2017. ^ "Menorca, Spain - Climate data". Weather Atlas. Retrieved 14 December 2017. ^ "Minorca Geography - Information, climate and weather in Minorca". www.minorca.com. ^ "Island Games: Menorca pull out of hosting 2019 event". 6 July 2015 – via www.bbc.co.uk. ^ Article 4, Statute of Autonomy of the Balearic Islands, 2007: "The Catalan language, typical of the Balearic Islands, will have official consideration, together with Spanish." ^ Trager, James (1995). The Food Chronology. New York: Henry Hold and Company. p. 163. Burns, Robert I., (1990) "Muslims in the Thirteenth Century Realms of Aragon: Interaction and Reaction", p. 67, In: Powell, J.M. (ed.) Muslims under Latin Rule, 1100–1300, p. 57–102, Princeton University Press. ISBN 0-691-05586-6. Pons, G., (2000). Les papallones diurnes de les balears., pp87. Edicions Documenta Balear, Palma de Mallorca. 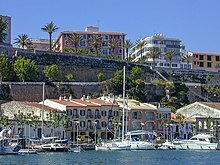 Wikimedia Commons has media related to Menorca. This page was last edited on 14 April 2019, at 06:45 (UTC).